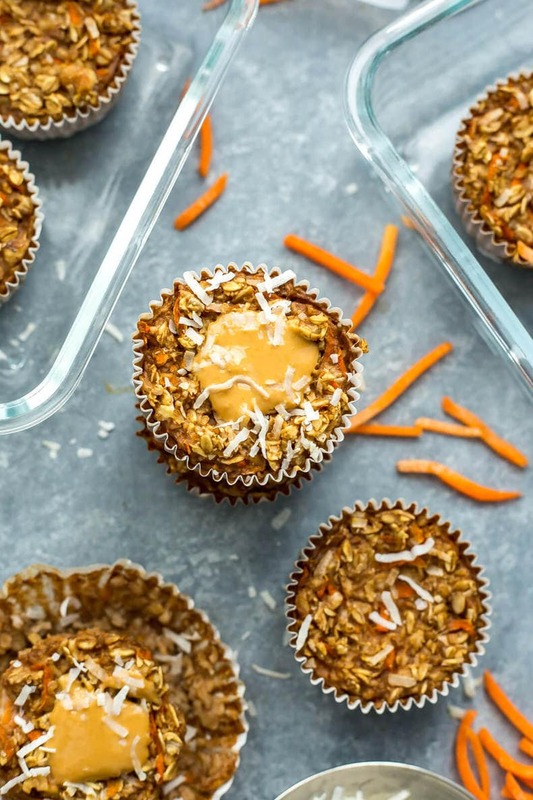 These Meal Prep Carrot Cake Oatmeal Muffin Cups are a delicious grab and go breakfast idea low in refined sugars and high in fibre – plus they've got veggies hidden in them! Into Easter but not so into all the sweets? 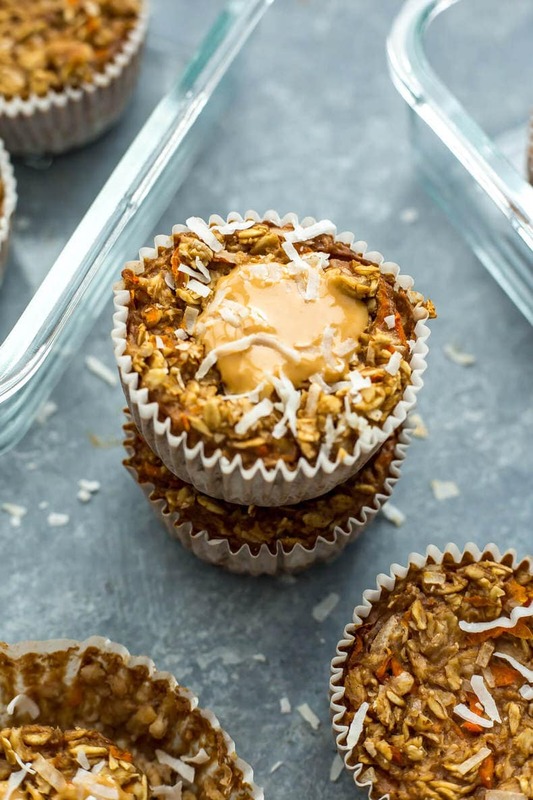 Then these Carrot Cake Oatmeal Muffin Cups are exactly what you need in your life!!! 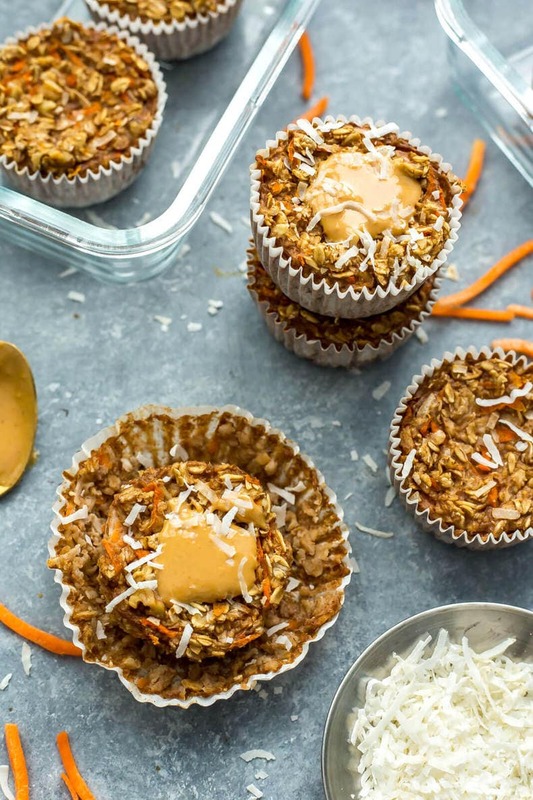 Not only are they the perfect breakfast, but they are basically a healthy version of a muffin without all the sugar and flour. 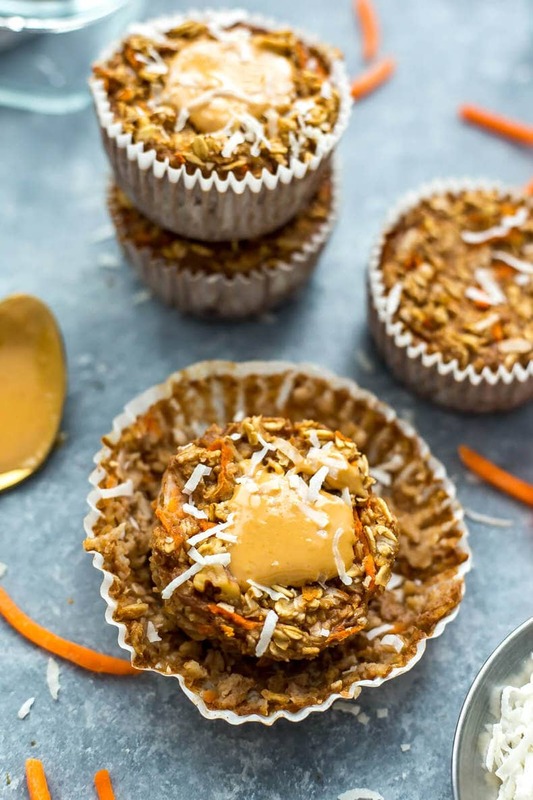 These oatmeal muffin cups are about as simple as it gets: a bunch of rolled oats, maple syrup, eggs and almond milk make up the base, and from there it's just about adding in your spices and extra fillings like coconut, carrots and nuts. I actually love sneaking veggies into breakfasts and baked goods (like these Avocado Chocolate Zucchini Muffins) – they actually tend to add moisture and prevent them from drying out, and you can cut back on not so healthy ingredients like butter, flour and sugar all at the same time. 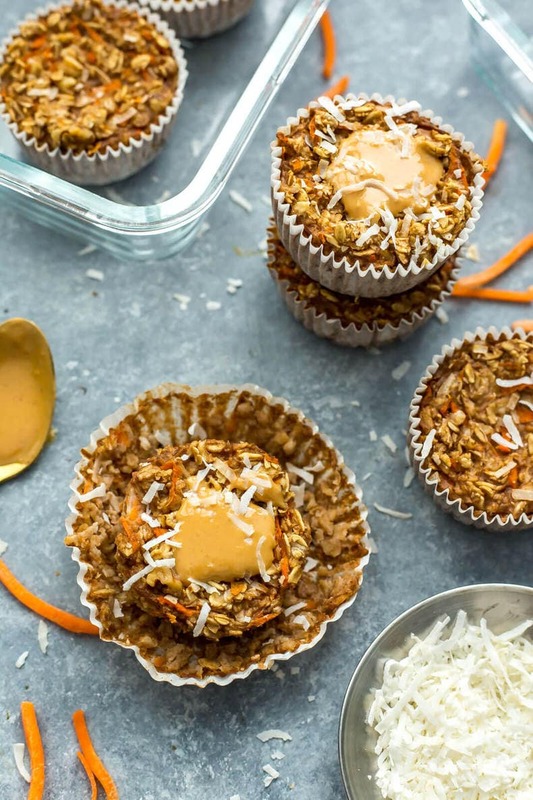 I wish they had a better alternative to sweeteners out there so I ended up using some maple syrup in these Meal Prep Carrot Cake Oatmeal Muffin Cups, but you could also easily use honey as well. Almond, coconut or regular dairy milk also works with this recipe, although the calorie count and nutritional information will be a bit different than what's listed below. I love a good breakfast where you can make substitutions! 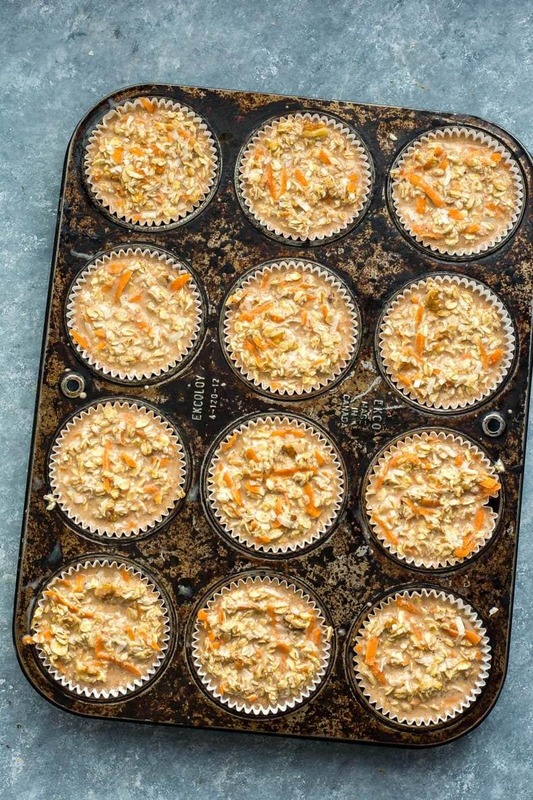 Perhaps the best part of these Meal Prep Carrot Cake Oatmeal Muffin Cups is that they are the ultimate grab and go breakfast! Filled with veggies, fibre, protein and healthy fats, you really can't have more of a well-rounded first meal of the day! 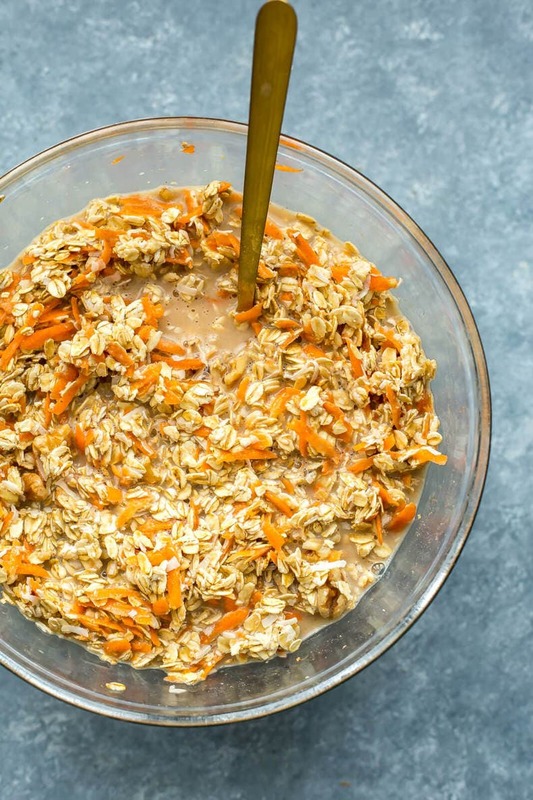 I top mine with a little bit of almond, cashew or peanut butter and pop them in the microwave for 30 seconds and they are also a comforting, warm breakfast on an early spring morning. It's kind of funny I'm putting together such a healthy breakfast idea considering I have trouble eating breakfast in the morning. Usually what I've been doing lately is actually making a giant frittata at the beginning of the week and cutting it into 5 different portions and eating it cold. When I was younger and in university I actually used to eat random odds and ends for breakfast, mostly leftovers and salty things. I am reaaaaally into savoury foods and find I just don't have time to meal prep the stuff I like for breakfast. However as I've gotten older I've found myself gravitating more and more toward sweeter things in the morning and I've grown to be quite the oatmeal lover! So, I guess that's why you're starting to see so many oatmeal cups popping up here. I can't help that they are the perfect grab and go breakfast. And you don't even need to refrigerate them or anything – they'll last on the counter up to 5 days! 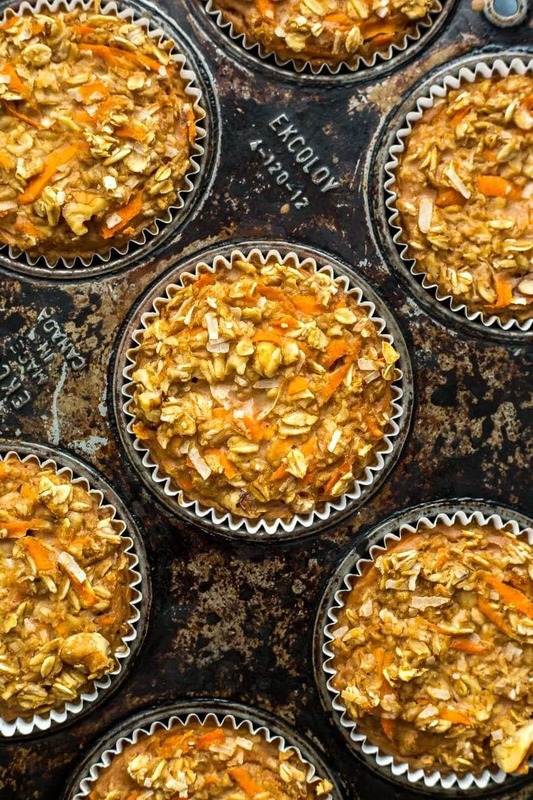 Will you be making these Meal Prep Carrot Cake Oatmeal Muffin Cups? I think I need more fun breakfast ideas like these in my life! What are some of your go-to grab and go breakfast recipes? 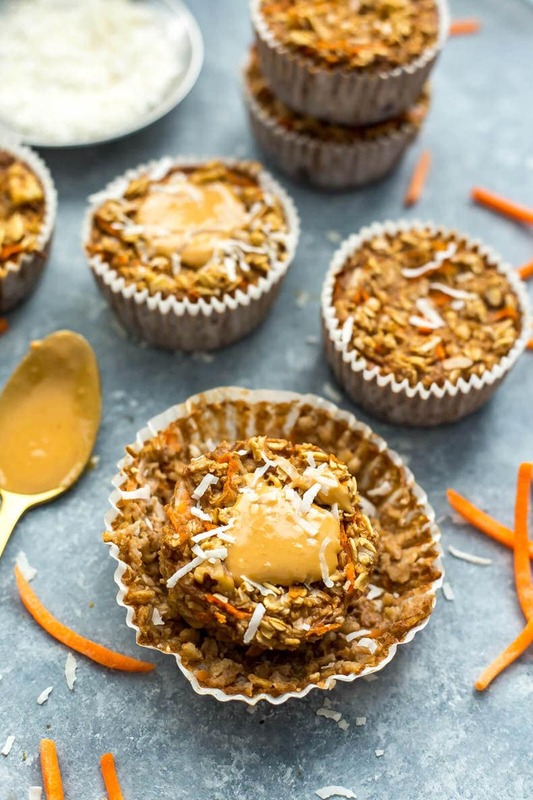 These Meal Prep Carrot Cake Oatmeal Muffin Cups are a delicious grab and go breakfast idea low in refined sugars and high in fibre - plus they've got veggies hidden in them! Your recipes look good, but it’s frustrating with the amount of pictures bloggers are putting up these days. It’s getting ridiculous. The more I stroll, the more that keep loading up. It gets harder and harder to get to the darn recipe. Hey Missy – thanks for your feedback. The reason I include so many photos and make each post so long is to account for time on page so I can make money from advertisers and support myself financially. 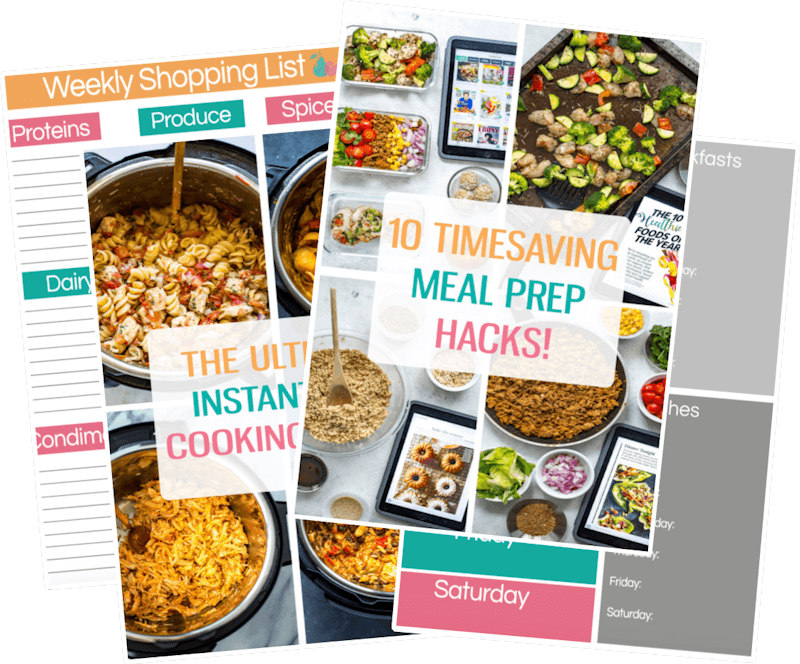 In exchange for ads and very minor scrolling time, you are getting a free recipe. 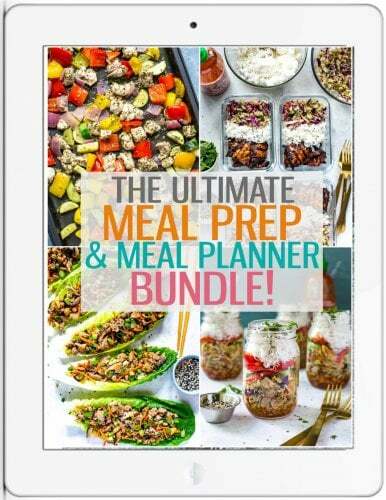 If you would like to avoid so many photos, you can purchase a magazine subscription or a cookbook. However, you should note that at that point you wouldn’t have the ability to search for recipes or interact with or make requests to the recipe creator, you would just get what you get. I can understand your frustration but at the same time there’s always gotta be a bit of give and take. In this case, I feel that a little bit of scrolling is worth it for a free recipe, and unfortunately I have bills to pay and can’t work for free. Update: Ok, so I tried it with regular oats, not steel cut. I followed the recipe exactly. Only after I tasted the batter, I added 1.5 tbs of powered stevia and 1.5 tbs of granulated erithol. These tasted absolutely yummy and the walnuts gave it a nice texture. 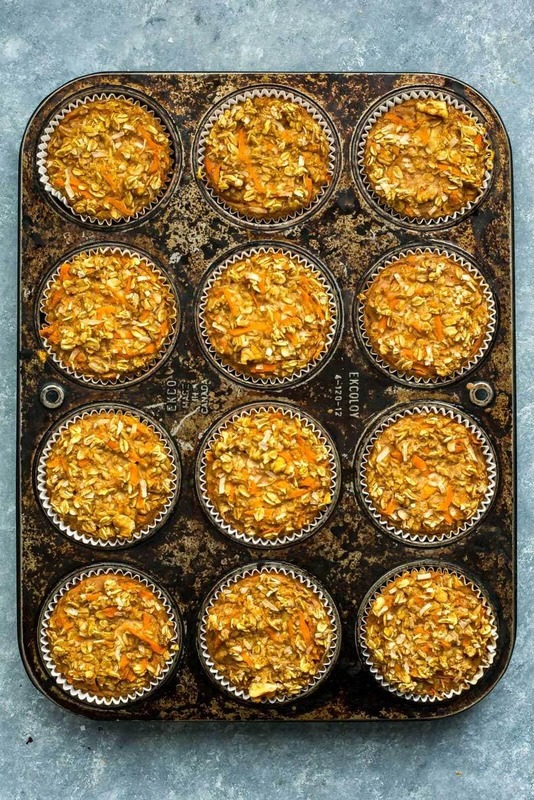 However, they were billed as “basically a healthy version of a muffin without all the sugar and flour.” The texture on the outside was nice, but the insides tasted like baked oatmeal and nothing like a muffin. I was really looking for a muffin. So, I make tweak the recipe and use less liquid. I’m not sure. Maybe I used the wrong kind of oats. I would love to know what others used.